It isn’t often critics put their money where their mouth is and commission new works, but that’s what Annette Morreau has generously done – in tandem with the Wigmore Hall – to induce Frederic Rzewski to compose a major new work, Ages. 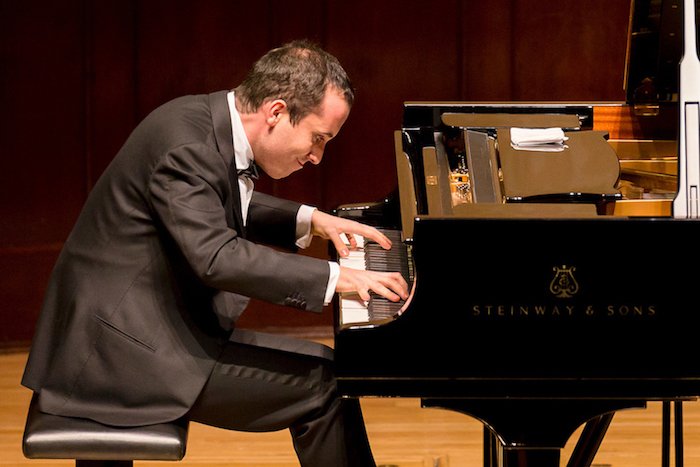 And it was entirely appropriate that they should have entrusted its world premiere to the pianist who has championed this American composer’s work, Igor Levit. Rzewski’s oeuvre is predominantly social-historical. His best-known piano work is The People United Will Never Be Defeated, variations on a song by the Chilean leftist Sergio Ortega which Levit has recorded. This new work, the composer said in a programme note, has been prompted partly by the approach of his eightieth birthday, and partly by his sense of history; Morreau had originally asked for a set of variations on Purcell’s Music for a While, and although that was not forthcoming there are moments when its gentle cadences shine through. One American critic has described Rzewski as ‘a granitically overpowering piano technician, capable of depositing huge boulders of sonoristic material across the keyboard without actually wrecking the instrument’. And indeed one shuddered at Levit’s opening flourish, which was to slam the keyboard lid shut with all his strength; after that explosion we listened to the harmonic echoes dying slowly away, before he launched into a long series of gently ascending major and minor triads. Lasting just over an hour, the piece was in five movements, but it came across as one single labyrinthine rumination in which violence alternated with restraint, grand pianistic virtuosity with child-like playfulness employing a battery of unexpected materials. A kazoo, a bird-whistle, a baby-call, and a recorded lamb’s bleat were just some of these, with Levit providing more by sighing or hooting like the wind. The result was a tissue of effects, a sequence of fleeting dreams, with delicate hints of Bach and Purcell indicating a philosophical underpinning. In his note Rzewski made reference to Mendelssohn’s Songs Without Words which he likened to ‘mystical niggunim’ – Chasidic melodies for meditation. Levit played three of these, before launching into Ronald Stevenson’s heroic transcription of the Adagio from Mahler’s Symphony No 10. This was a recital like no other. The explosive crash of the piano lid at the beginning of Rzewski’s new work ‘Ages’ represents ‘The Big Bang’ of existence!